Balsamic vinegar There are 15 products. Balsamic Vinegar of Modena PGI "2 stars" has a bittersweet taste tending towards velvety with medium to low acidity. And 'suitable for dressing salads, eggs and omelettes, especially onion. L \ 'Aceto Balsamico di Modena "3 stars" has a bittersweet taste with medium acidity. It has a high degree of refinement that allows him to accompany very well with meats both roasted and boiled. 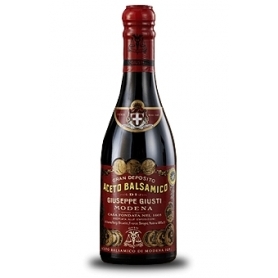 Aceto Balsamico IGP "Aged" has a balanced flavor and a robust body. It is produced without adding caramel. traditional balsamic vinegar of Modena, in the "Mature" version, excellent quality and certified by the consortium of protection. Balsamic Vinegar of Modena PGI Bordeaux Label is a low density vinegar taste sour and fruity. It is suitable for salads and grilled vegetables. 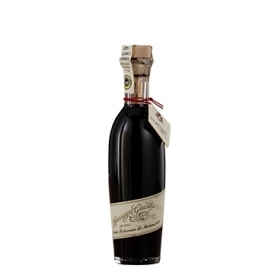 L 'Aceto Balsamico di Modena IGP Blue Label is a dense vinegar, rich in aromas and extracts. It is indicated for grilled meats and fine cheeses. 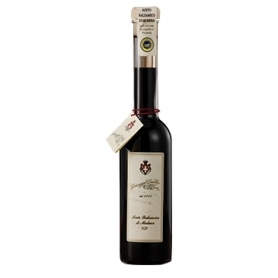 L 'Aceto Balsamico di Modena Green Label is a vinegar from the well-balanced sweet-sour taste with velvety nuances. To season your fresh stuffed pasta, a balsamic vinegar of Modena IGP of great density and sweetness. From Acetia with the oldest barrel battery in the world. Two of the best balsamic vinegars come together to create an exclusive condiment. You will find in the dish the unmistakable spicy and fruity notes of Balsamic Vinegar of Modena "2 Gold Medals" enhanced by the perfect density of the precious "3 Gold Medals". Recommended for vegetables. Acidity: 6%. Made from balsamic vinegar of Modena IGP "2 Medals dOro", aged in the new battery of precious wood barrels. Versatile balsamic, perfect for meat dishes. Acidity: 6%.